Description: This annual plant is about 3-12" tall, branching frequently and having the appearance of a miniature bush. Fern-like leaves up to 2" long and ¾" across alternate along the hairless stems. These simple, double, or triple compound leaves are pinnately divided into linear lobes. From the axils of the upper leaves, there develops flowerheads on stalks about ½–1½" long. The flowerhead of each stalk is about 1/3" across, and consists of numerous greenish yellow disk florets and no ray florets. Each disk floret has 4 tiny lobes at its apex. The base of the flowerhead has several overlapping green bracts that are lanceolate or ovate with papery upper margins. The top of the flowerhead is shaped like a dome or blunt cone. Both the foliage and flowerheads have a pineapple-like odor when they are bruised or crushed. The blooming period occurs during the summer and lasts about 1-2 months. Each disk floret is replaced by an oblong achene that is broader at the top than the bottom. The achenes are without awns or tufts of hairs. The root system consists of a branching taproot. This plant spreads by reseeding itself. Cultivation: The preference is full sun, mesic conditions, and gravelly or compacted soil. Competition from taller plants is not tolerated for very long. Range & Habitat: Pineapple Weed is a common plant in central and northern Illinois, but it is somewhat less common in the southern areas of the state (see Distribution Map). This plant is adventive from the Pacific Northwest. 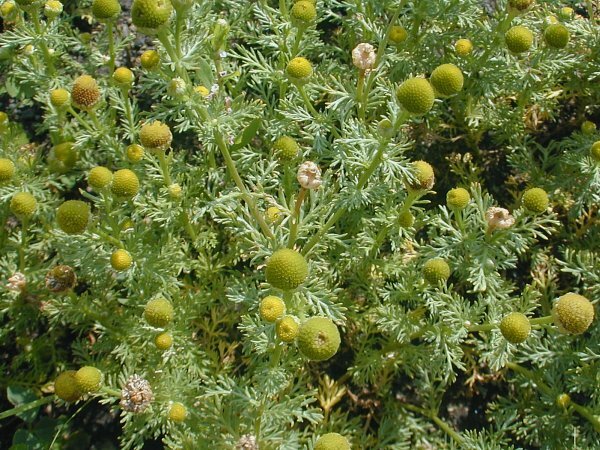 In addition to eastern North America, Pineapple Weed has since spread to northern and western Europe, where it is not native. Habitats include stony slopes of pastures, barnyards, edges of driveways and sidewalks, gravelly areas along railroads and roads, and sunny waste areas that are rocky or gravelly. Disturbed areas are strongly preferred. Faunal Associations: The flowerheads attract flower flies (Syrphidae) and are probably pollinated by them. Little is known about this plant's relationship to birds and herbivorous mammals in the NE or Midwest. Cattle reportedly make little use of it as a food source. 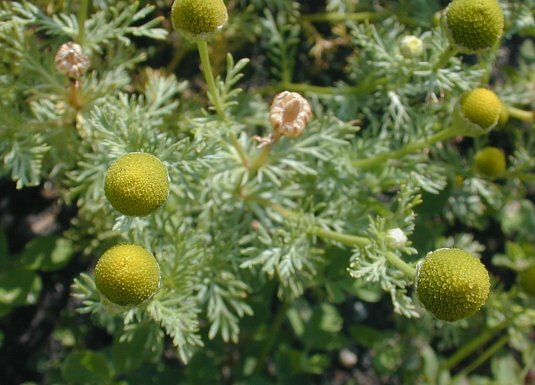 It is possible that the seeds or flowerheads stick to the tires of motor vehicles and for this reason Pineapple Weed often occurs along roadsides and driveways. Photographic Location: Along a gravelly slope near a driveway in Urbana, Illinois. Comments: This odd-looking little plant is closely related to the mayweeds, chamomiles, and other weedy daisies that have been introduced into North America from abroad. They share the same kind of highly dissected foliage. However, Pineapple Weed lacks white ray florets in its flowerheads, unlike the others, and it is less showy in appearance as a result. Another scientific name for this species is Matricaria matricarioides. The common name refers to the scent of the foliage and flowerheads, and possibly the appearance of the latter.